We’ve recently brought you a series of interviews with successful entrepreneurs who deal with online directory business. 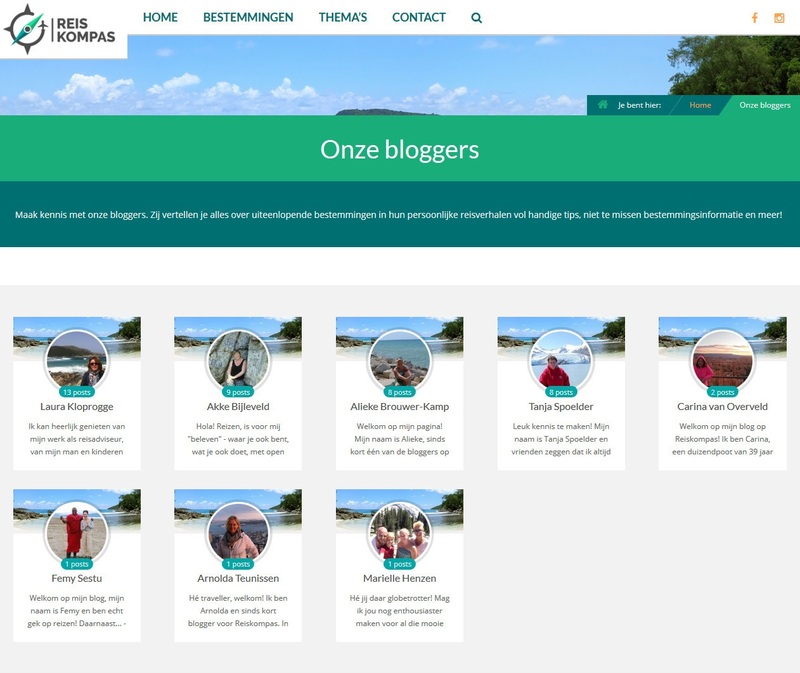 Today we would like to show you the implementation of our unconventional Multi-Author Blog Theme. This template allows you to create a blogging portal where multiple bloggers can participate in at the same time – including individuals, freelancers or digital nomads from around the world. Our Multi-Author Blog Theme offers tailor-made features that can’t be found in any other WordPress theme. 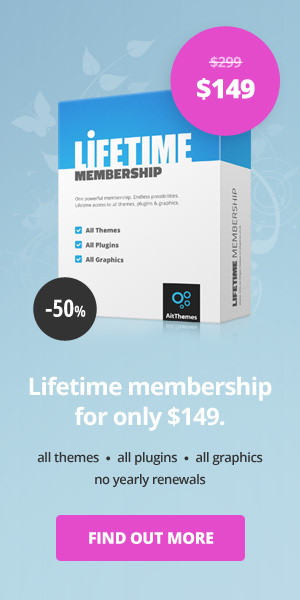 We’ll show you how they work in real life when used on a real website of one of our customers. 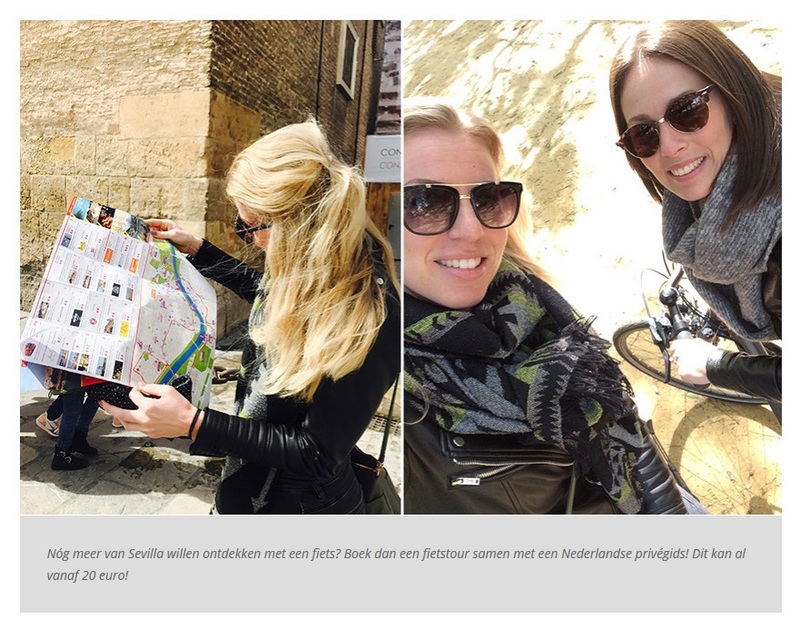 Reiskompas.nl focuses on presentation of interesting tourist destinations, travel tips and experiences. More than 8 bloggers, as well as the editorial team of the portal, are involved in the content building. Due to the fact that the portal creators decided to focus on readers from the Netherlands, the whole blog is in Dutch. That’s why currently only one language version is available. However Multi-Author Blog is a multilingual theme, which means that as soon as bloggers decide to write in a different language, this theme will allow this to happen without any additional technical interventions. There are several dominant elements on the homepage visible straight away. Full width slider, featured blog posts, as well as the most important categories these posts belong to. These correspond to the items in the Mega Menu. What distinguishes this travel theme from others, however, is an interactive Google map with pins, that serves for blog post localisation. Thanks to this you can see what part of the world (what country, city, place…) the article is written about directly on the map. Reiskompas is a larger portal with a number of traveler posts and these posts are visualized by icons on the map. Icons are color-coded at the same time. Turquoise color represents grouped icons and the number on the icon provides the number of posts for that location level detail. The individual articles are marked with smaller icons in magenta color. The functionality for having the added blog posts visualised on the map is provided by Extended Google Map Element. Thanks to this feature the blogger can assign GPS coordinates (if author knows them) or location address directly to the post. If the author knows just the address, GPS coordinates are automatically generated so that the post can be displayed on Google Map at its exact location. Google Map Element also allows for the colored Post Markers to be used in various other sections of the page. 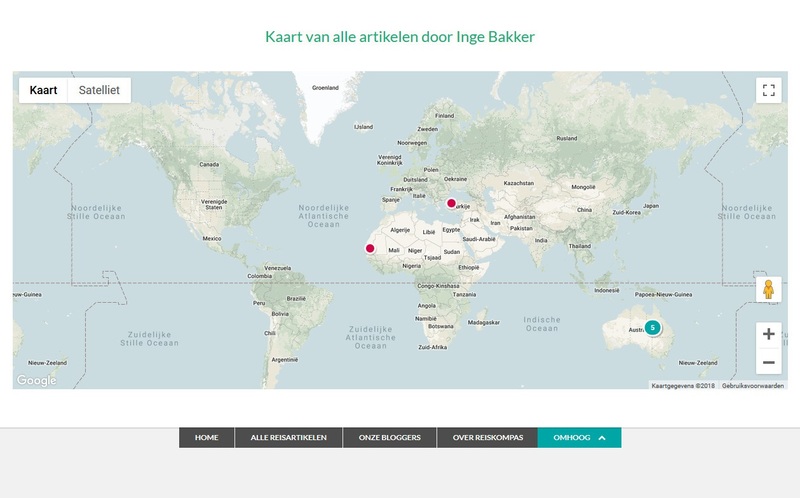 They can display the location of the particular article on the map within the post detail or all posts from one particular author on one map. 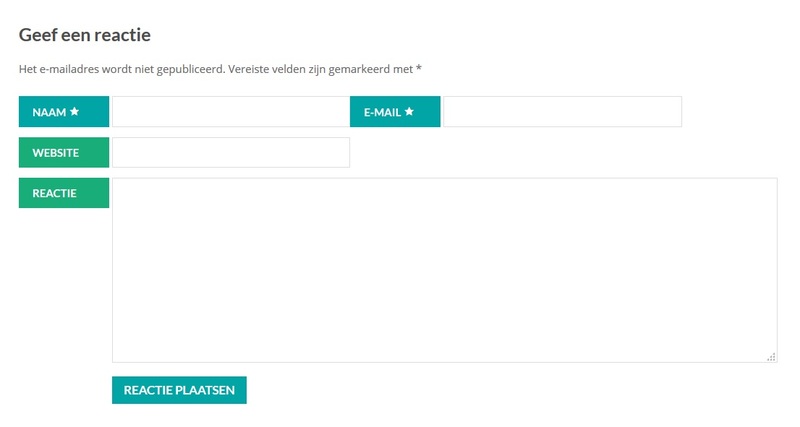 Portal Reiskompas also uses this option, e.g. for Author page Inge Bakker. Post Markers here show all the posts of this blogger on the map. At the same time, each blogger can partially adjust his/her own Author page. 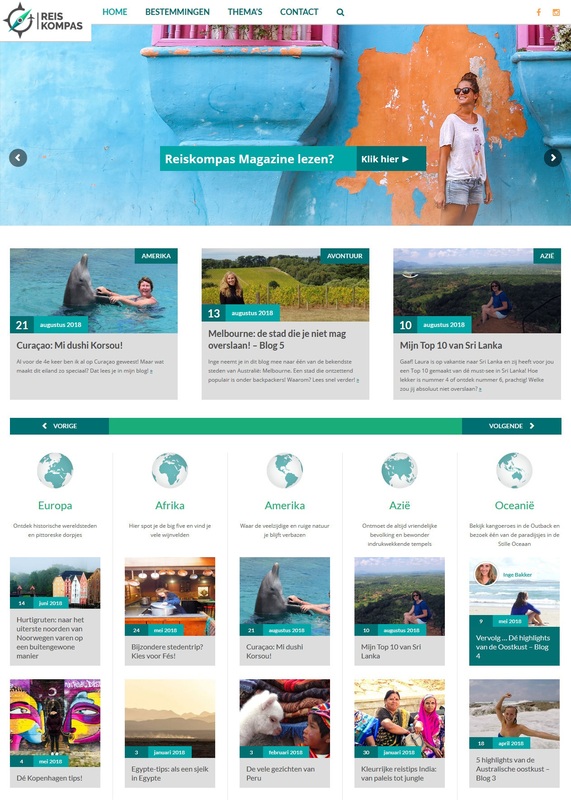 All Reiskompas contributors have their profile photos and short text about themselves in order to introduce themselves to the readers of this travel blog. The content is the most valuable part for each blogging portal. It is for this reason that the greatest emphasis is put on the post detail. 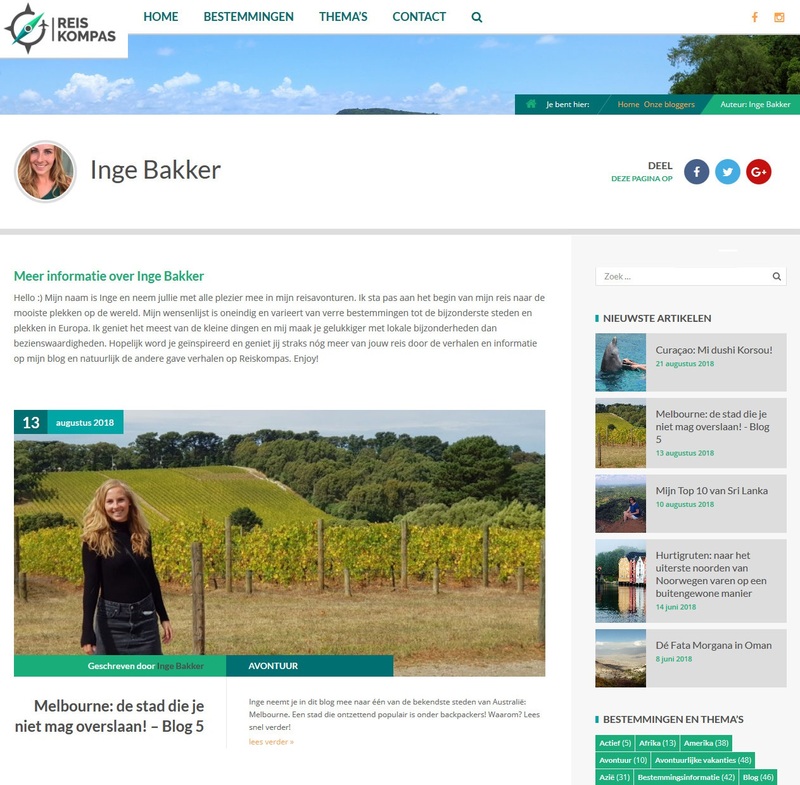 Reiskompas has several main categories and subcategories (similar to Mega Menu items) allowing readers better orientation on the website – especially when looking for an article on a particular topic. That’s why each blog post has categories listed on the right hand side. Share icons are located next to the post title for instant sharing on the most popular social networks like Facebook, Twitter and Google+. Every blog post performs better when contains photos. Multi-Author Blog theme is designed to make it easier for bloggers to work with images, as well as to make them look good on the website. Portal Reiskompas uses blog post variant Post with Gallery and Carousel. Page Header with Carousel is right at the start of the article and it automatically plays individual photos, which adds dynamics to the post. The blog post contains a gallery of images belonging to that article. What’s interesting, the Multi-Author Blog theme allows to display different caption text based on the total number of images. If a smaller number of images is added, the caption text is placed under the image (as is the standard for the most of WordPress themes). If multiple images are added, the caption text will appear on top of these images – see image on the right below. Bloggers use our shortcodes within the post detail. These allow adding of buttons with cross links – for example to access the reservation system for the accomodation in the particular country the article is written about. Comments Element form provides readers with the option to add their comments below the article, and this element is directly integrated into Multi-Author Blog theme. This travel blog uses also the basic element provided by the Multi-Author Blog Theme – the Author’s Element. Its main functionality is the display of selected bloggers across the entire website. The order of individual bloggers can be sorted by different criterias, like number of blog posts or ratings. Reiskompas uses this element within the Bloggers subpage, while contributors are sorted by the number of articles. The author with the highest number of posts is on the 1st place. There are many WordPress travel themes and blogs, but most of them stand on one traveler. And he/she has limited time and financial resources to cover the various countries of the world in a relatively short period of time. The advantage of a blogging portal, such as Reiskompas, is that thanks to the Multi-Author Blog theme, an unlimited number of authors can contribute at the same time. This means that new and new posts with unique content are constantly getting added to the blog. This creates a community of travel bloggers who are able to continually write about their experiences and keep the stable readers base. More about Multi-Author Blog features. 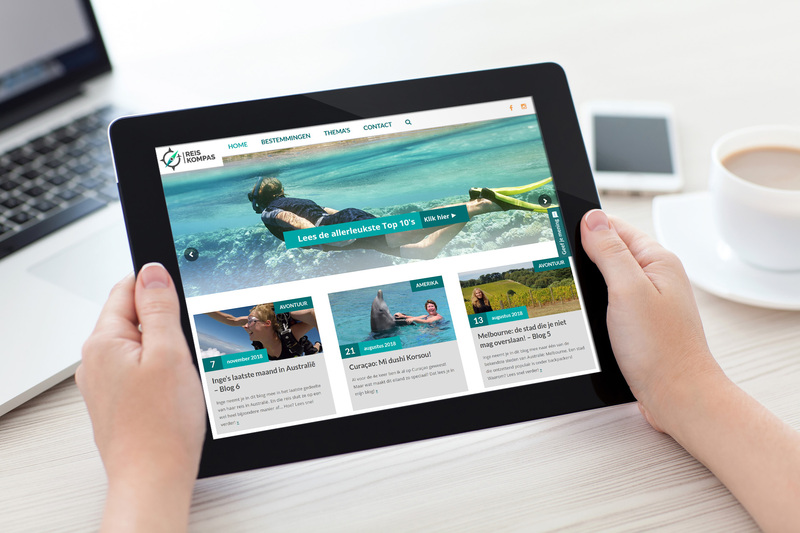 This case study is just one of many successful projects using our theme as a travel theme. However, Multi-Author Blog is a universal theme and can be used for building any blogging portal on any topic. Make your own Multi-Author Blog right now!